With almost 22 years in the business, Frank Hines is an expert in the culinary world. Frank started as a chef with Greek House Chefs and has worked his way up to Director of Operations. 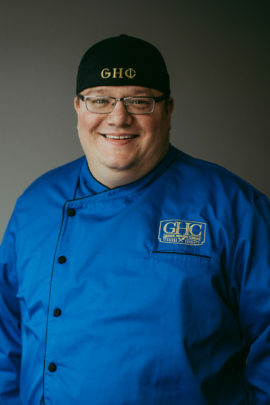 From cooking home-style meals in his kitchen to hiring and managing, he is trained in many aspects of the culinary world. Frank grew up in the restaurant industry… literally. He was in his Grandparents’ restaurant The Chuck Wagon on a regular basis when he was a kid. Being around the restaurant sparked his love of cooking and gave him first-hand knowledge that lead him to Iowa State to study Hotel and Restaurant Management. From there, Frank decided to go to culinary school in Chicago at Cooking and Hospitality Institute of Chicago, Le Cordon Bleu Program. He took his first job cooking at The Pump Room in Chicago. After several years of sharpening his skills, he moved back to Iowa. Frank has worked at well-known restaurants throughout the Midwest, including Splash Seafood and he even opened and created the menu for Jethro’s BBQ. After 5 years with Jethro’s BBQ, Frank was tired of the nights, weekends, and holidays grind. This lead him to a unique opportunity with Greek House Chefs with the chance to cook for a Fraternity at Iowa State. With this opportunity, Frank fell in love with the company and has been devoted to it ever since. Frank worked up the ranks from Chef to Area Manager and then on to Director of Operations. In his spare time, he is a die-hard Cubs fan and enjoys spending quality time with his wife and son.